The Pathos Grace is pure magic. It is a gem of the watchmaker’s art that will captivate watch lovers at first sight: a masterpiece whose elegance, rich variety and consummate craftsmanship cannot fail to be a source of fascination. The Pathos Grace is pure magic. It is a gem of the watchmaker’s art that will captivate watch lovers at first sight: a masterpiece whose elegance, rich variety and consummate craftsmanship cannot fail to be a source of fascination. But it is also much more than that: for anyone who examines the Pathos Grace in greater detail will be unable to break its enchanting spell. 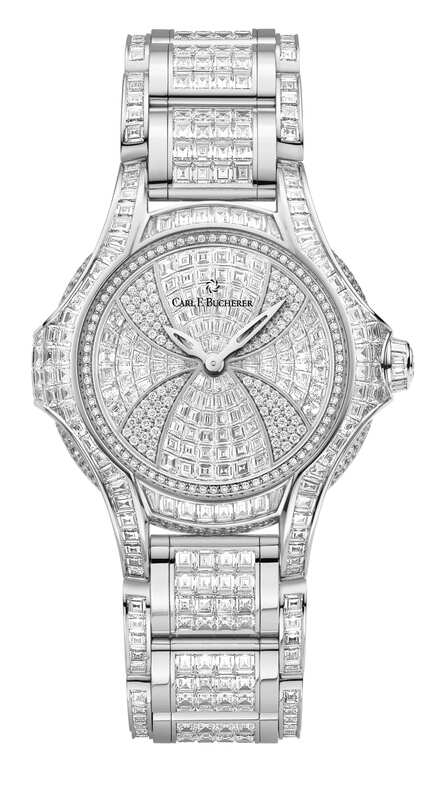 Each of the 910 handset diamonds contributes to the opulent yet delicate aesthetic appeal of this exceptional timepiece. Like stars, the precious gemstones transform the flowing white-gold surfaces of the dial and case into a sea of light alive with vibrant, sparkling reflections. They give the Pathos Grace its extraordinary aura: an aura that touches the soul and will cause that element of the divine in any woman to radiate.